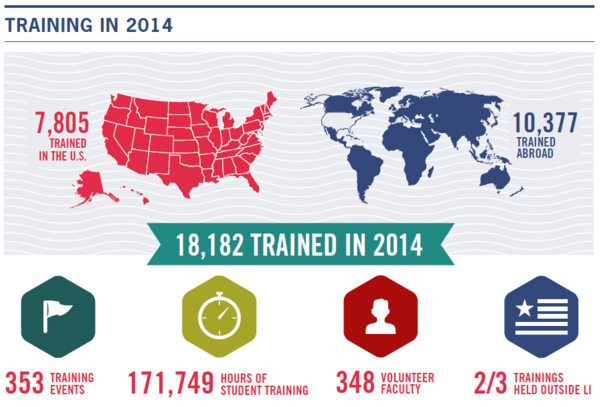 2014 was an exciting year for the Leadership Institute! From trainings to student activism and conservative events to career building, the Leadership Institute (LI) -- with the support of generous donors -- continued working to grow the conservative movement. LI’s staff and 348 volunteer faculty trained 18,182 students in 2014, bringing the total trained to 161,271 since LI’s 1979 founding. The Institute trained 7,805 students nationally and 10,377 students internationally. In total, LI hosted 353 trainings throughout the country and around the world. These 353 trainings covered 36 of the 44 types of LI trainings as varied as On-Camera TV trainings, week-long Campaign Management Schools and Comprehensive Fundraising Trainings, Grassroots Activism Workshops, Public Relations Schools, and Career Trainings. In 2014, LI added the Women’s Leadership Training, designed by women, for women. Over the year, 127 women graduated from this training. Following the 2014 Elections, LI staff have identified 30 LI grads elected to the U.S. House and Senate, 15 elected to state-wide office, and 421 elected to state legislatures. LI graduates are now serving as legislators in all 50 states. Graduates of Leadership Institute trainings are using their skills years after their training to win elected office. LI’s National Field Program staff identified 34,091 conservative students on college campuses around the country. These field staff added 394 new student groups to LI's unique network of affiliated conservative student organizations. 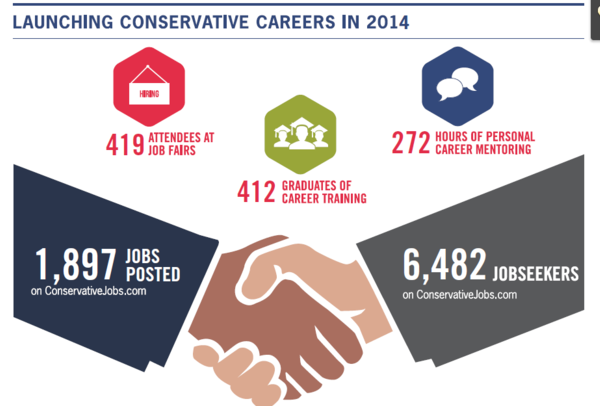 By the end of 2014, this network of conservative student groups had grown to 1,568. Many of the 707 articles that LI’s CampusReform.org published made national news, making the site America’s #1 source for campu s news online with 9.3 million page views. 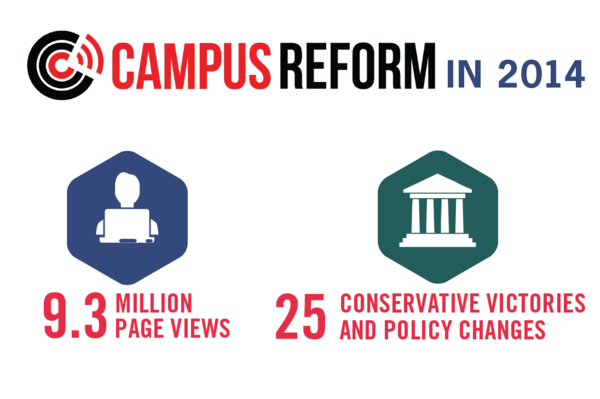 These CampusReform.org articles had a direct impact on college campuses and led to 25 conservative victories and policy changes on College Campuses. Viewers from all 50 United States and around the world have tuned in to LI’s free webinars since live webinars began streaming from LI studios in 2011. In 2014 alone, 2,080 viewers watched LI’s 23 webinars. LI’s Wednesday Wakeup Club Breakfasts hosted 1,284 attendees and 10 speakers in 2014. Speakers included: U.S. Senator Ted Cruz, Heritage Foundation President Jim DeMint, Americans for Tax Reform President Grover Norquist, and a record breaking breakfast with U.S. Senator Rand Paul with 302 attendees. LI’s 43rd National Fourth of July Conservative Soiree hosted 954 attendees. This year’s featured speaker was Civil War Historian and movie director Ron Maxwell. LI’s 6,482 job seekers had 1,897 available jobs posted to peruse on LI’s ConservativeJobs.com website. LI’s Career Services Center hosted 419 attendees at job fairs and offered 272 hours of personal career mentoring for free. LI’s 35 interns came from 31 colleges, 21 states, 3 countries, and spent 5,094 hours combined in LI training. It’s been a good year at the Leadership Institute, and LI is excited about what 2015 has in store! How has LI helped you? Email Carol@LeadershipInstitute.org to share your story. LI is always looking to spotlight faculty doing incredible things for the conservative movement, notable LI graduates making waves, and college students taking a stand on campus.